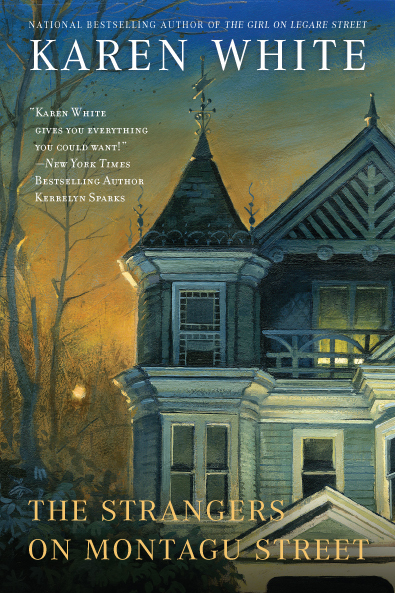 The Strangers on Montagu Street by Karen White combines historical mystery with romance, drama, and Southern hospitality, like all of the other books in the series, reuniting readers with Jack Trenholm — famous author — and Melanie Middleton — real estate agent for historic Charleston homes and resident, if reluctant, ghost whisperer. Melanie can be whiny and she can grate on readers nerves with her penchant for denying her feelings for Jack and her rocky relationship with her parents. However, in the latest installment, readers are introduced to a more evolved Mellie, a woman who can relate to a angsty and sarcastic teen girl who shows up unannounced and claims to be Jack’s long-lost daughter, Nola. Melanie can’t help but see herself in Nola, and a maternal instinct she never knew she had rises to the surface. White has carefully crafted this story, meshing the Nola storyline with that of the ghost mystery on Montagu Street. As always, Marc Longo is back and more underhanded than ever, and even Mellie’s cousin and Jack’s sometime girlfriend, Rebecca comes and stir things up. In addition, it looks like there is more restoration work to eat through Melanie’s budget as the foundation needs repairs, and did I mention she’s feeling her age — especially as her mother and Nola help to remind her how old she’s getting? White’s humor is subtle at times and at others it’s quite obvious, but what is most engaging is her characterizations and how different and real each feels to the reader. The Strangers on Montagu Street is the third book in the series, but it may not be necessary to read the other two before reading this one as the mystery stands alone, though if readers prefer to know the past struggles between Mellie and Jack it would be better to read the previous two. White’s Tradd Street series is a cozy and perfect for holiday reading. Of the three in the series, this is my favorite and since White has left me hanging at the outcome between Mellie and Jack’s latest entanglement, you can bet I’ll be reading the next one.